Citation Information: J Clin Invest. 2018;128(1):207-218. https://doi.org/10.1172/JCI94955. Synovial sarcomagenesis occurs in proximity to bone. (A) Representative MRIs demonstrate the relationship of human SSs to bone in 5 patients with tumors directly abutting the bone surface (black arrowheads) and 1 patient in whom the tumor did not touch the bone directly (white arrowhead), abutting instead the knee joint capsule. 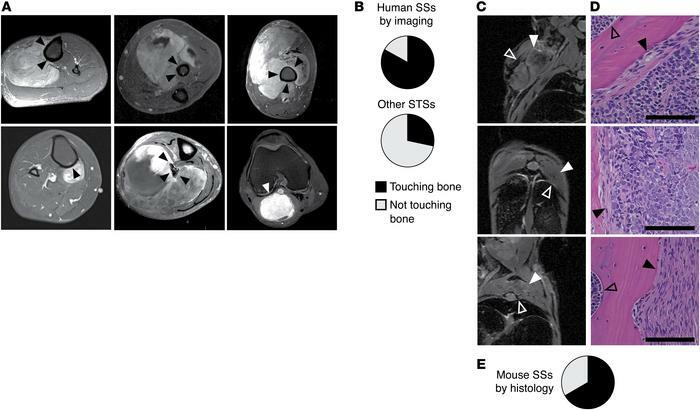 (B) Pie charts demonstrating the prevalence of neoplasms touching bone among human SSs (n = 48) and neoplasms near bone (within 1 centimeter) among non-SS human soft-tissue sarcomas (STSs) of the extremities (n = 28). (C) MRIs demonstrating SSs (solid white arrowheads) and adjacent bones (empty white arrowheads) in Myf5Cre hSS2 mice, as well as (D) H&E-stained histology images from the same, demonstrating tumor cells abutting, involving, or replacing periosteum (Black arrowheads indicate the periosteal surface with tumor involvement. Open arrowheads indicate the endosteal surface and marrow space.). Scale bars: 100 μm. (E) Pie chart demonstrating the prevalence of tumor cells touching the bone surface in random sections of tumors from 8 mice (n = 33 tumors).